Gemstones are graded according to their 4Cs, just like diamonds. Color is a predominant factor when choosing a gemstone. Gemstone color is defined in terms of hue, saturation and tone. Hue is the primary gemstone color, saturation is the purity or intensity of color and tone is the lightness or darkness of color. GIA defines 31 gemstone hues, six levels of color saturation and a 0-10 scale for tone. Best and most valuable gemstones are those that exhibit only one pure hue with slight traces of additional hues. Similarly to diamonds, gemstones also have inclusions and blemishes. The mere existence of inclusions and blemishes is not so important as their position and consequently their visibility. The least visible inclusions are those under the bezel facets and near the girdle. Gemstones are usually divided into three categories. The first category comprises gemstones that are generally inclusion-free, such as Amethyst, Citrine, Topaz and Zircon. The gemstones from the second category usually have a few inclusions and blemishes. Some of them are Alexandrite, Ruby, Sapphire, Spinel and Tourmaline. 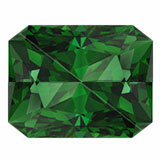 The third category contains gemstones that are almost always included, such as Emerald, Red Tourmaline and Red Beryl. Gemstone clarity grades range from Very Very Slightly Included (VVS) to Included 3 (I3). VVS grade stands for gemstones without any inclusions or with inclusions so minute that are hard to spot under 10x magnification. Included 3 grade describes highly prominent inclusions that have very negative effect on gemstone clarity and consequently its price. Gemstones are typically cut to highlight their color, although carat weight, brilliance, symmetry and polish are taken into consideration as well. Depending on the cut, gemstones may be faceted or cabochon cut. Transparent gemstones are faceted to maximize their light exposure and brilliance, whereas opaque gemstones are cut as cabochons to emphasize their color. Gemstones with highly saturated color may have shallower cut, whereas those with low color saturation allow deeper cut. Good gemstones are well proportioned and symmetrically cut. The greater the carat weight, the higher the price of a gemstone, provided that its cut, clarity and color are satisfying as well. However, the carat weight is not the same as the size of a gemstone, due to the fact that the specific gravity or density is not the same for all gemstones. For example, 1 carat sapphire is smaller than 1 carat diamond, as a sapphire has greater specific gravity than a diamond. Gemstones undergo various treatments to enhance their appearance and accentuate their beauty. Almost all gemstones are treated in some way; those untreated are very rare and expensive. Some of the treatments, like heat treatment, have been in use for centuries so far and are now considered a standard procedure. Any gemstone treatment should be clearly disclosed, as some of the treatments are hard to spot or may improve a gemstone’s appearance but compromise its durability. Heat is applied to gemstones to permanently change or enhance their color and clarity. This treatment is stable, oldest and most commonly used of all, widely accepted by the jewelry industry. Gemstones that are most frequently heat-treated are sapphires, rubies, tourmaline, zircon, topaz, citrine, amber, aquamarine and amethyst. Heat treatment is irreversible and usually not discernible. Although heat treatment generally does not affect gemstone durability, certain measures of precaution are advised as heat may render some gemstones brittle. These are also among the oldest and commonly used gemstone enhancement techniques practiced for centuries. Such treatments make a gemstone’s natural inclusions less visible and improve its clarity. Fracture filling implies filling a gemstone’s cracks, fissures and cavities with colored or colorless substances like wax, oil, glass, plastic or resin. Flux healing is usually applied in combination with heat and implies infusion of gemstones with the molten flux of chemicals that will melt the inclusions and close fractures that were once open. As emeralds almost always have considerable number of natural inclusions, fracture filling improves their appearance. Rubies are also frequently filled with glass to make them more transparent or to make their surface reaching cavities less visible. Gemstones enhanced in this way must be carefully cut to avoid the leakage of infused substances. Exposures to high temperatures or to changes in air pressure are also to be avoided as this may alter the substances used as fillers. Irradiation involves gemstones being exposed to radiation in order to permanently alter and enhance their color. A gemstone is bombarded by electrons or neutrons in a nuclear reactor to change the atomic structure of its crystal lattice and consequently change a gemstone’s light interaction, which results in its color change. Irradiation is usually followed by heat treatment. Blue topaz is usually color enhanced this way. This treatment serves as the surface enhancement and involves gemstones being lacquered, enameled, foiled or inked to improve their durability and appearance by hiding the blemishes or intensifying the color. Although this treatment is not considered very stable or permanent as the coating may be prone to scratching, it is frequently used, especially with topaz, tanzanite, cubic zirconia and quartz. Gemstones are infused with dye to change or enhance their natural color and to make the color more uniform. Pearls and black onyx, famous for its rich color, are dyed this way. This treatment may not be permanent if the dye used is unstable and of low quality, easily removed by chemicals such as ammonia, acetone or alcohol. This treatment is hard to discern and it involves the use of chemicals, light or heat to lighten the gemstone color, remove its color or improve color uniformity. Some gemstones are first bleached and then dyed. Jadeite jade and pearls are often bleached, usually with hydrogen peroxide. Bleaching may make gemstones more prone to breakage, thus, bleaching is frequently followed by impregnation to improve gemstone durability. Gemstones usually fall into two categories, precious and semi-precious, although the American Gem Trade Association (AGTA) deems such division deceptive and disapproves of the term semi-precious. Diamonds, sapphires, emeralds and rubies are considered precious gemstones due to their alluring beauty, rarity and hardness. Other gemstones are not so hard and can be more frequently found, thus the label semi-precious. Another not so precise division is between diamonds and colored stones, as there are fancy color diamonds and a colorless sapphire that is regarded as a colored stone. Diamonds are considered to be the most amazing and unique of all gemstones, as they are the only gemstones formed out of just one element (carbon) and their journey from simple graphite to brilliant diamonds is long and strenuous. The hardest stone on the Mohs scale of mineral hardness, diamonds are extremely rare and thus quite pricey and attention grabbing. Their price is even higher when they come in various colors, ranging from yellow to black. Sapphires are most frequently blue, hence the name, from the Greek word for blue - 'sappheiros'. Their blue color is usually the result of trace minerals such as titanium or iron. Sapphires belong to the corundum family and are very hard gemstones, 9 on the Mohs scale. Sapphire is the birthstone for those born in September, the gemstone of the 5th and 45th wedding anniversaries and the symbol of harmony, friendship and loyalty. Clear, vivid, bright blue sapphires are most sought after, although sapphires can less frequently come in many other colors, such as yellow, green, orange, violet, pink, brown, gray or black. Some sapphires are known to change their color from greenish and grayish blue in daylight to purplish or brownish red in incandescent light. Sapphires are often beryllium and heat treated or irradiated to enhance their color. 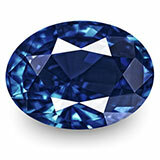 Sri Lanka is the biggest producer of sapphires. Emerald is a variety of beryl, usually green or greenish blue in color due to traces of chromium or vanadium. Aquamarine is also a member of beryl family. Although the hardness of beryl is 7.5 – 8 on the Mohs scale, emeralds are prone to breakage due to a significant number of inclusions. Emeralds are usually filled with oil that has a similar refraction index to cover up those inclusions and make them less visible. There is still a dispute among gemstone graders how much green an emerald should be to be graded as emerald and not as green beryl. The most sought after emeralds are those that display bright and vivid grass-green color. Emerald is the birthstone of those born in May and the gemstone for the 20th and 35th wedding anniversary. It is deemed to be the sacred stone of the goddess Venus and the symbol of faith, hope, wisdom and love. The largest emerald production is in Colombia. Ruby is a red gemstone, also a member of corundum family just like sapphire, but with chromium as a trace mineral that causes its reddish color. 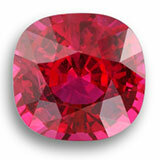 The term ruby originates from the Latin word “ruber” meaning red. Ruby is a very hard gemstone, 9 on the Mohs scale, with only diamonds and moissanite being harder. The symbol of love, passion, fire and power due to their red color, rubies are the most expensive among colored gemstones. Ruby is also the birthstone for those born in July and the gemstone for the 15th and 40th wedding anniversaries. Fluorescence in rubies enhances their color and makes them even more compelling. Sri Lanka, also known as the “Island of Gems”, is the world’s leading producer of rubies. Alexandrite is a variation of the mineral chrysoberyl, with hardness of 8.5, famous for its color-changing properties. Its color ranges from green or bluish-green in daylight to red, purplish red or raspberry red in incandescent light, hence the name: “emerald by day, ruby by night”. Alexandrite is a rare and quite expensive gemstone, named after the Russian tsar Alexander II, as it was discovered in the Russian Urals on the day the tsar came of age. It was the national stone of tsarist Russia, as it displayed red and green colors, the colors of old Imperial Russia. The symbol of creativity and imagination, Alexandrite is now found in Brazil, Sri Lanka, Zimbabwe, Burma, India and Madagascar. Amber is not a mineral, it’s organic in origin, a fossilized resin that contains the remnants of flowers, seeds, leaves, insects and other forms of life millions of years ago, providing scientists with the precious insight into prehistory. It is soft, easily cut with knife, with 2.00-2.5 hardness on the Mohs scale, golden brown, yellow or orange in color. Apart from jewelry, amber was once used in perfumes due to its nice smell when rubbed and as a natural medicine due to the belief that it transforms negative into positive energy. Six tons of amber were used to make the Amber Room, the gift to the Russian tsar Peter the Great. Amber is very light and floats in seawater, usually called the gold of the North, as it is most commonly found at the Baltic coast. It can also be found in the Dominican Republic and, unlike Baltic variety, Dominican amber is almost always transparent and has more natural fossil inclusions. Amethyst is the purple and most sought after version of the mineral quartz with hardness of 7 on the Mohs scale. Its name originates from the Greek word “amethystos” meaning “not drunk”, as it was believed that amethyst provided protection against alcohol intoxication. Due to its alluring purple color, amethyst is used for both most expensive jewelry pieces and easily affordable mass-produced jewelry. Although it is high in demand and has no naked-eye visible inclusions, Amethyst may often display the undesirable effect of uneven color distribution known as color zoning. If heat-treated, Amethyst may turn into Citrine, the yellowish to brownish-red variety of quartz or into Prasiolite, also called Green Amethyst. The birthstone for those born in February, Amethyst is also known as the Bishop’s stone, worn by Catholic Bishops, the healing stone against insomnia and the gem for the 6th and 17th wedding anniversaries. It is mined in Brazil, Russia, South Korea, India and USA. Aquamarine is the blue to greenish-blue variation of the mineral beryl named after the Latin word for seawater. It was believed to calm waves and was worn by sailors to protect them at sea. Admired for its color, great clarity and high transparency, Aquamarine has the hardness of 7.5-8 on the Mohs scale, similarly to emerald that is the green to greenish-blue variety of beryl. Aquamarine crystals tend to be large in size and may display optical phenomena known as asterism (star effect) and chatoyancy (cat’s eye effect). Both asterism and chatoyancy occur in gemstones shaped as cabochons. Asterism refers to the effect of four, six or twelve rayed stars displayed on the gemstone surface due to the reflection of light from minute, parallel needle inclusions made of titanium dioxide (rutile). Chatoyancy refers to well-defined bands of light displayed across a gemstone surface due to tiny titanium dioxide inclusions that run perpendicularly in respect to streaks of light displayed as the cat’s eye effect. To enhance its color and make it pure blue, Aquamarine is often heat-treated. The birthstone for those born in March, Aquamarine is usually given for the 19th wedding anniversary, as it is believed to make marriages happy. The best Aquamarine comes from Brazil, but is also mined in Nigeria, Kenya, Madagascar, Russia, Sri Lanka, Pakistan and Afghanistan. Garnet is not just one stone; it’s the family of closely related isomorphous gemstones found in great variety of colors, with hardness between 6.5 and 7.5 on the Mohs scale. Garnets are named after the Latin word “granatus” meaning grain or seed, as they resemble pomegranate seeds. The most frequently found Garnets are red ones, whereas the rarest is the blue Garnet, followed by the green Garnet called tsavorite. They range from highly transparent to opaque stones. All Garnets are found in metamorphic rocks; their crystal structure is the same, but the chemical composition is different. Some Garnets exhibit color-changing properties just like the gemstone Alexandrite. Garnets are divided into two groups. The first group comprises Garnets whose second element is aluminum, such as Pyrope, Almandine, and Spessartine, whereas the second group contains Garnets whose first element is calcium, such as Uvarovite, Grossular, and Andradite. The birthstone for those born in January, Garnets are the gemstones for the 2nd and 6th wedding anniversaries. It is also cherished as travelers’ stone; the myth says Noah had a piece of Garnet on his Arc as a navigation tool. Garnets are found in Brazil, Argentina, South Africa, Australia, Switzerland, Scotland and USA. Iolite was named after the Greek word “ios” meaning violet. In mineralogy, it is also known as Cordierite, named in honor of a French mineralogist Pierre Cordier. Iolite is a pleochroic mineral, violet-bluish in color, never treated or enhanced in any way, with hardness of 7-7.5 on the Mohs scale. Due to its violet-bluish color that usually lacks depth, Iolite is also called “a poor man’s sapphire” or “water sapphire”. It was allegedly used by the Vikings to determine the direction of the sun on cloudy days. Iolite owes its bluish color to iron and titanium similarly to a blue sapphire, but unlike blue sapphires, Iolite cannot be heat-treated for more intense color due to its low melting point. Iolite absorbs light differently when viewed from different angles and consequently displays different colors due to its pleochroic properties, which makes it very difficult to cut for best color. Given for the 21st wedding anniversary, Iolites can be both faceted and cabochons. It is found in Sri Lanka, India, Brazil, Africa and Norway. Jade is the term that covers many gemstones, but pure jade is found only as jadeite and nephrite. Jade is named after the Spanish expression “piedra de ijada” meaning “stone for the pain in the side”, as Native Americans were observed to hold jade at their side in order to heal various illnesses. Jade was regarded as the stone of love in ancient Egypt and was highly praised by Aztecs and Mayans, too. In Chinese culture, Jade is known as the imperial stone or the stone of heaven, hence the saying "gold is valuable; jade is priceless". Although the hardness on the Mohs scale is 6.5 to 7 for jadeite and 6 to 6.5 for nephrite, Jade is quite tough, which made it highly suitable for prehistoric tool and weapon making. The most precious variety of jade is semi-transparent, emerald green in color, known as Imperial Jade. There is also Russian Jade that is leek green. Other jade colors include yellow, orange, gray, brown, black and white. Although jadeite and nephrite are similar in appearance, their chemical composition is different. Jadeite is more rare and more precious than nephrite and the easiest way to differentiate between the two is to strike them, as nephrite rings and produces a musical tone, whereas jadeite does not. Jade is often bleached to remove brownish hues, which may make it more prone to breakage. The gemstone for the 12th wedding anniversary, jade is found in Russia, Mexico and Central America.